I would like to thank Emily, Ryanne, Cherish, Sydney, Amanda, Allison, Kerrin, and Alicia for such a memorable, fun, and exciting season. I am so proud of all of you and how much you have grown not only as volleyball players but also as teammates from the start of the season. I am also thankful that you have made that commitment to not only me but each other. You all have followed the proud tradition of this program and have set a positive example to upcoming players in the future of the hard work, devotion, and time it takes to be a better player. I could not be prouder of all of you. I offer to you all my heartfelt thanks. I would like to honor my dynamic duo of seniors, Kerrin and Alicia. It seems that these two have been together forever and it is fitting that they will be finishing their volleyball careers together on this floor. Kerrin and Alicia have both been playing since the seventh grade. 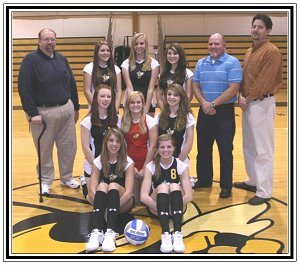 They have a combined seven years varsity experience and three titles in volleyball. They have made a memorable mark in the volleyball program at F.C.S. that will be tough to be equaled. I want to thank you both for leading this young group of girls and not only helping them in their volleyball skills but also showing them what it takes to be a good teammate and most importantly a friend. We all could not have made it through this season if you two had not come in with a positive attitude and a strong will to make this season successful. On behalf of the rest of the team, we all thank you both for this. I would like to first thank Kerrin for her dedication, commitment, and most importantly all of the fun memories that were shared these past three years. It seems just like yesterday that Kerrin and I had a conversation that she did not just want to be labeled as a softball player but an athlete that could play a little volleyball too. Kerrin, you have far surpassed my expectations and that is a direct result of your attitude, hard work, and willingness to be coached. The contributions you made on the court may not have always showed up in the stat column in the newspaper, but the little things you did were always noticed by me. I never questioned your desire to get better each and every time you entered the court and most importantly, I never questioned your will to win. You always expected to win each and every game you played in without a doubt in your mind. You always were ready come game time. You have become a solid volleyball player and I thank you for that. You will graduate with your name on a divisional title trophy and were a major contributor in that memorable season. If I could thank you for one thing more than any other it would be the amount of times you put smiles on all of our faces. I may have come to practice a little grumpy at times but you always managed to do something so outrageous, I would go home smiling. You not only kept me loose, you did the same for your teammates. I will miss your sense of humor, positive spirit, and joy of life more than anything else. Thanks so much Kerrin Crazy Head!!! Alicia, it seems like yesterday that you were in pigtails in the 4th grade chasing around volleyballs as our manager. I never thought this day would come and come so quickly and it is one that I can honestly say that I have struggled with. I remember stopping by your house in 2005 after a play-off loss, handing you a volleyball, and telling you that you will be running the floor for the next four years. Alicia, you took that ball and ran with it. You will graduate with two divisional titles, a sectional finals berth (hopefully 2), multiple first team all-star selections, MVP and all-tourney team selections, plus being recognized by the newspaper and local radio for your accomplishments on the floor. You will graduate with more career and play-off wins than any volleyball player that has come through this program. You will also have more assists than any setter that has played on this floor wearing a Hornet jersey. You have put in the time and effort year round in order to be the volleyball player that you have become. I cannot thank you enough for what you have done for this program. I can honestly say that you will graduate as one of the most decorated, skilled, and accomplished volleyball players that I have ever had the pleasure of coaching. I cannot imagine entering this floor next year without seeing you on the court. You have set an example of what it takes to not only be a great player but also what it takes to be a great leader and teammate and have been associated with so many great matches that I have had the pleasure of coaching in. I will miss the very memorable times we had over your career and the many, many laughs. More significantly, I will miss the passion and the love you have for this game. A trait that both of us share. Kerrin and Alicia, thank you from the bottom of my heart. I will miss you both more than you know. I love you girls. In closing, I want to thank all of the parents for their support this year. I know that it is a huge time and money commitment in order for us to be successful. I could not have done this without all of your support for your children, the team, and this program. I want to thank all of the fans (students, alumni, friends, and relatives). The girls appreciate your support each and every game. Thanks go to Neil Waterman and all of the drivers, June Prince for all of her help, Steve Arnold and the custodial staff for their help (Mr. Lucas), Mike Murphy for setting up the sound system and microphones and finding time for us in his busy schedule, Mr. Leichner and Mr. O’Connor, the Board of Education, and the Sports Boosters. I would like to thank Mrs. O.-T. for working the scoreboard and doing the announcing. I would also like to thank Mr. Hazelton for all of his help. I want to thank Meg for being our scorekeeper. You are an important part of our team. I want to thank Coach Bob Howard for joining our staff this year and committing his time and enthusiasm to me and the girls. We all appreciate your help and insight. Thanks go out to Coaches O’Leary and Stockmeyer for their commitment to success in the modified program. A huge thank you goes to Coach Wakelee for his time, effort, and commitment to the jayvee program. I benefit from the standards all of you set for the young ladies going through this program. I also want to thank my family and friends for their support. Lastly, I want to thank the most important person in my life and my best friend, my wife Janinne. I could not do this without her love and support of me and the girls.